7" non-marring,shock absorbing rubber wheels. The lightweight design is strong and easy to transport. Folding grip handles make it easy to transport loads. Folds and extends quick and easily. Rolls smoothly on 7" rubber wheels. Constructed of strong aluminum and steel. Padded top handle for comfort. Large bottom plate to carry larger loads easliy. Great for the office, travel and home use. 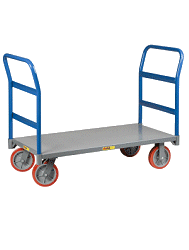 The handle system allows for two comfortable hand positions when moving items. I bought the Red Baron collapsible hand truck. It had a problem with 1 of the handles that stuck open and broke off when I tried to close it. Customer service was great! They didn't waste any time, they just sent a replacement and prepaid return shipping label. I would definitely recommend this product and this company! And the replacement is great! This dolly is perfect for medium loads. Good quality. Well worth the money. Is a quality product. Very well made and useful. Red Baron Rocks My World! The Red Baron hand truck is awesome. I often have to carry and set up heavy equipment for my performances and everything about the Red Baron exceeds expectations in a perfect way size, carrying capacity, ruggedness and operation. An added plus is the Red Baron's snazzy appearance all my colleagues notice it right away and ask me about it. I couldn't be happier. It functions exactly as expected. Easy to store. Because I have to be careful lifting anything, and my old hand truck requires items to be lifted to work, this new, shiny, cheerful handtruck is a terrific addition to my life. It is compact, very easy to use, and the plate easily slides under cartons. It is a pleasure to use and folds to a small profile. Excellent product understated capacities works easily up & down steps and up and over curbs and sidewalks . Large deck plate makes for easier move of large items. Very well constructed yet light. fold out handles great for extra support. I use this to move heavy musical equipment around. What is great is that when this is folded up, it fits into one of my cases! I wish that the main handle would go up about another foot, and that the swing handles would actually lock into place. Once the hand truck is up and extended fully, and the swing handles are out, if I accidentally bump a handle, it will come out of the socket. Other than that, this is a great hand truck.